Skill: Rope climbs- Accumulate 10 rope climbs. Pick a variation that is challenging for you: seated,regular, leg less or L-sit. GET A GREAT WARM UP. FRONT SQUAT: pick a weight that is approximately 60%-65% of 1 rm. perform 1 set x 20 reps. after 10 reps do 3 big breathes between each rep. breathing squats. tough. should be very hard. 3. back extensions: 3 x 10 no weight but pause 4 sec at top….squeeze the scapula!!! squeeze the glutes. 4. sit ups x 100 total…use weight behind head. break up the sets and reps anyway you would like. Strength: (15 minutes) 1 Hang Power clean+ 1 Power clean 1 set every 2:00 8x. Build to a heavy complex for the day. STEP 1: Cut an opening inside the mozzarella, being careful not to cut all the way through. 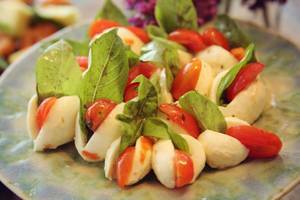 Add one halved cherry tomato and a basil leaf inside each mozzarella "pocket." STEP 2: Arrange on a serving platter and drizzle with olive oil! YOU ARE GOING TO HATE THIS WORKOUT!!! get a good warm up. -back squat: work up to approximately 55-60% of best squat. then perform 1 set x 20 reps….breath 3 times between each rep after the 10th rep!!! -ice bath or cold shower in the pm. Warm-up: After dynamic warm up include: 3 Minutes of Tabata Hollow Hold, Arch Hold, alternating. Skill: (15 minutes)Ring muscle ups- work on progressions and technique. If you have them down 3 sets of max unbroken muscle ups for the day.